Big Sky is one of Montana's foremost travel destinations, located midway between Bozeman and West Yellowstone and home to two world-class resorts, Big Sky Resort, and Lone Mountain Ranch. 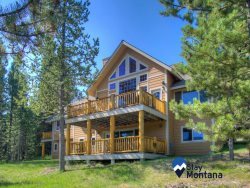 No matter when you come to visit, there are so many things to do, see and explore as well as a ton of great Big Sky vacation rentals to call home while here! During the winter months Big Sky is a mecca for a wide range of snow sports and activities - alpine, back country, and cross-country skiing; snowboarding, snowshoe trekking; and performing arts events. The warmer, summer months provide access to whitewater rafting, fly-fishing, and hiking. Just outside of Big Sky Town Center, the Ousel Falls trail is a favorite hike among locals and travelers alike. It is a great hike for families with kids or dogs. Pick a sunny meadow for a picnic and enjoy the mountain wildflowers along the way. Take a day trip through the canyon to Bozeman, driving north along the Gallatin River. There are many pull-outs along the way where you can stop and enjoy the special natural features and spectacular views. Whether you are coming for the winter slopes or year-round fly-fishing, Big Sky gives travelers a great taste of Montana. Start planning your Big Sky vacation today and be check out our available Big Sky vacation rentals to find the perfect place for your stay in this beautiful area. There are so many reasons why you should visit Big Sky, come find out why today! Skycrest Penthouse with Amazing Location and Views - New Listing & Hot Tub! Cozy Curley Bear Condo with Community Pool and Hot Tub, New Listing! Firelight Escape with Private Hot Tub and on Free Shuttle Route! Little Plume Lodge - Ski-in/Ski-out, Hot Tub, New Listing! Little Plume Flat - Ski-in/Ski-out, New Listing! Saddleridge Slopeside Retreat - Ski-in/Ski-out, Hot Tub, New Listing! Firelight Retreat with private Hot Tub & on free shuttle route! Alpenglow Escape with hot tub and amazing views! Fly Fishing Cottage on the Gallatin River!